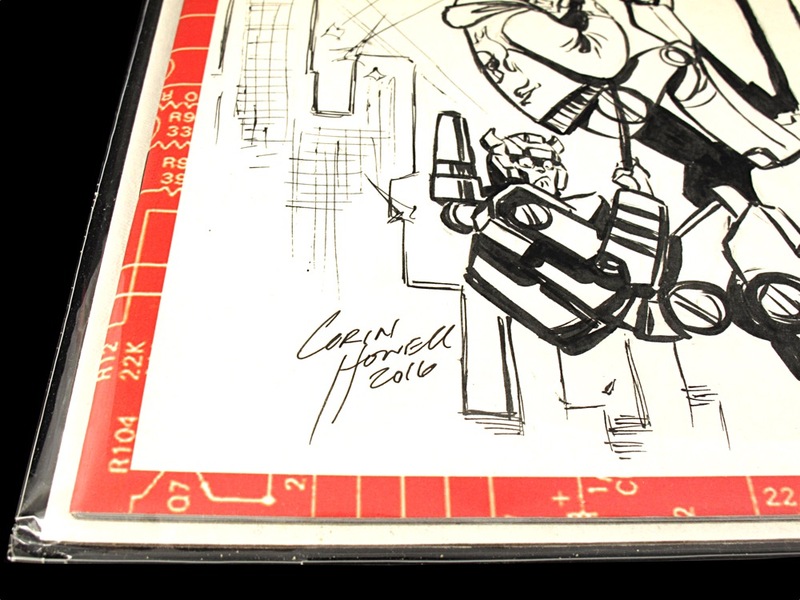 Today, let’s continue our Comic Book sketch cover education with artist Corin Howell. 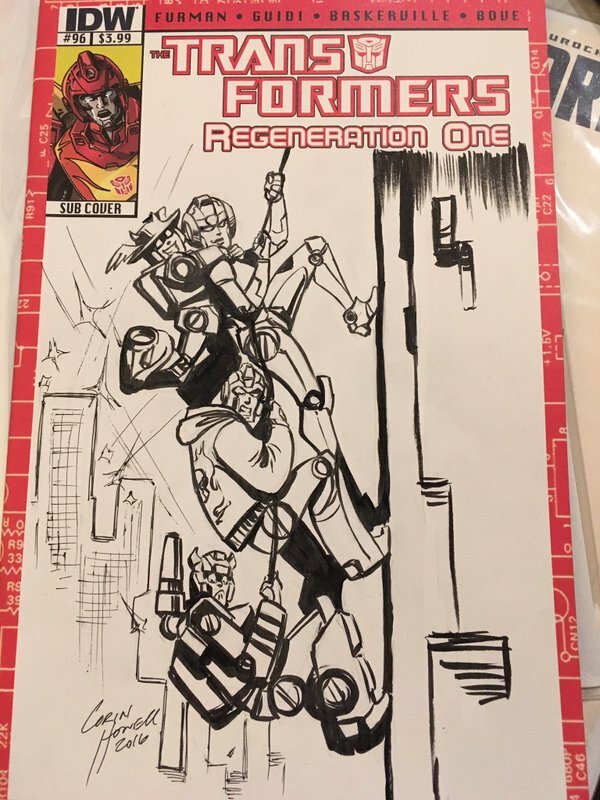 Corin’s art has been seen on the pages of not only Transformers comics, but also X-Files, Ghostbusters, Bravest Worriers, Jem and the Holograms, Back to the future, and Star Trek to name just a few. This lady has her artistic hands in a little bit of everything which is a true testament to her skills. Corin did a sketch cover for me last April at Emerald City Comic Con in Seattle, Washington. It’s a homage to the movie poster for Adventures in Babysitting. With RC, Bumblebee, Prowl, and Sideswipe taking the places of the actors on the movie poster. Corin is a sweetheart. She’s someone who is easy to talk to and really worked with me to make sure I got what I wanted from my sketch cover. I wasn’t able to interview Corin at Emerald City Comic Con, but I did catch up with her at TFcon Chicago last October. We sat down before the convention officially started to chat about sketch covers. Corin: It’s going pretty good. Yoshi: How are you liking the con that hasn’t started yet? Corin: *Laughs* Well, I’ve just gotten set up. Yoshi: You have. 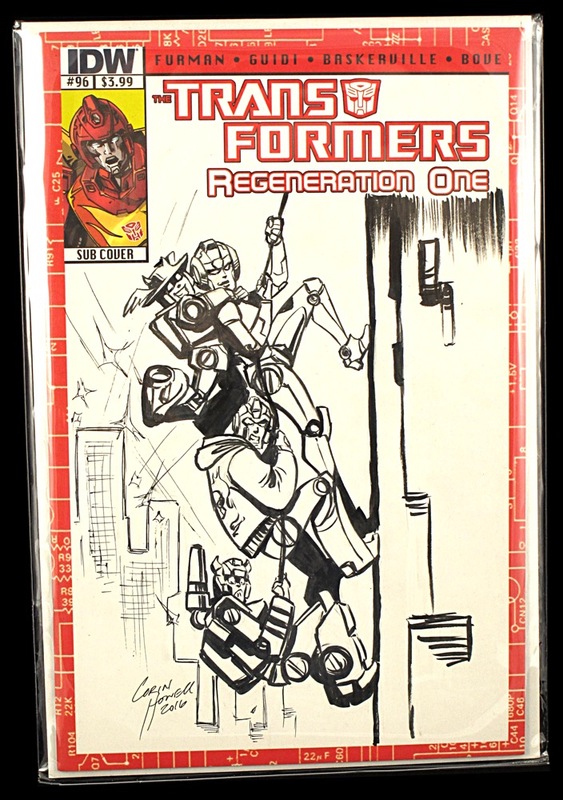 I really want to talk about sketch covers. Yoshi: And how awesome I think they are. So, first questions first. 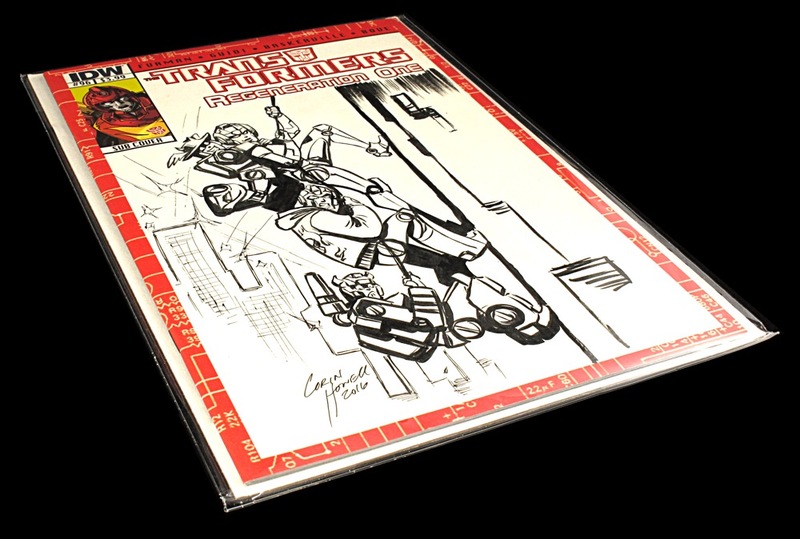 How much of your commissions at a show are sketch covers and do you see that number rising? Corin: Most of them are sketch covers these days. Like, I see more of sketch covers than actual like big 11 by 17 commissions. A lot of them are just like… there simple. There simple commission sketch covers. Like, I think at New York one of them was just like the red Power Ranger. And another one was just Jubilee. And another one was umm some fantasy character. It was just like all of them… like I had more sketch covers then I did actual commissions. It was… it was cool. ummm. But I didn’t expect it, I guess. Corin: I like them. I think there fun. Yoshi: You like doing them? Yoshi: What, so, I get the impression from what you said that you would almost welcome more, more of a complex request on a sketch cover. Yoshi. Okay, because I know there are some people who are just like headshots or you’re not getting anything. Corin: I had so much fun with that one. Yoshi: Oh good, I’m glad you did. Corin: And the fun part was that I did actually watch that movie like a week prior. Yoshi: Awesome! So what was it, I did a, it was Adventure In Babysitting. So, the way I like to approach an artist is to try and hit them up prior to a convention. Yoshi: I’ve learned this lesson the hard way. uhhh, hit them up before a convention. Let them know what I want. Send them to reference images. Offer to mail the blank book so they have plenty of time to work on it. Yoshi: Is that something you prefer? Would you rather they just came up to you at the convention? Whats… What’s the game plan for Corin Howell? Corin: I… I really it before the convention because it’s really difficult because when people come to the convention they have a set amount of time that their there. So like some people are only there for like a day, or they are there all three days or four days. However long the convention is going to be that weekend. And I prefer to have them before so you can like set it to the rep or me personally. We can get it done and out the door and have it ready for you when the convention starts. Because when we’re at the convention and I mean… When somebody requests something really, ummm, complex like. I see a lot of artists I admire and a lot of my friends too that work like in other projects. 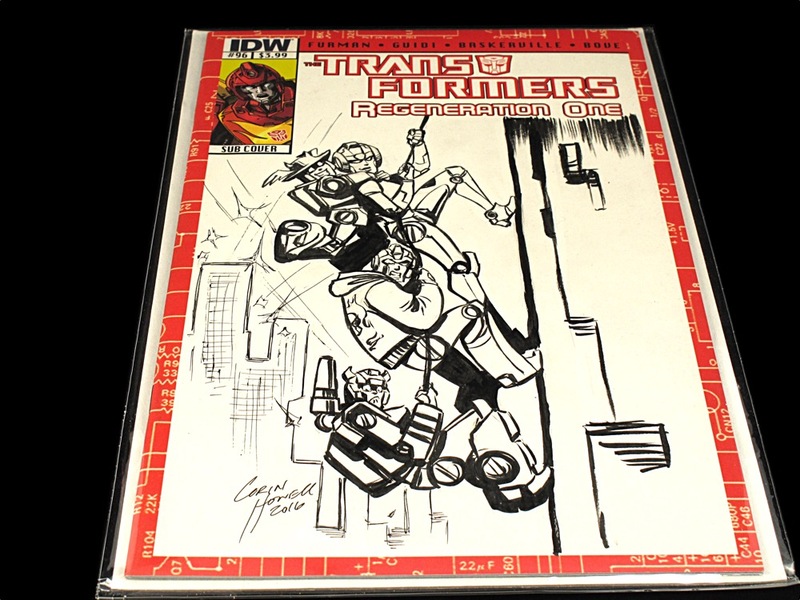 Other than Transformers or anything else like they get some complex sketch covers ummm. And they just, they don’t have enough time to get it out the door. Corin: Just seeing them trying to rush through, it’s just like incredible. Like, you got this done, but I can see you were having a hard time getting it done. Yoshi: Right, right. So more time is better than less time. especially if it’s more than just a headshot. Corin: Especially if it’s like. Having like a head shot is great because that is something quick and easy to get out. 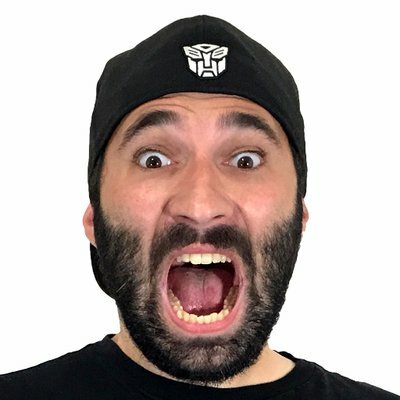 But like, if you… The way I see it is like if you want a sketch cover that you know is going to be the individual amazing sketch cover. 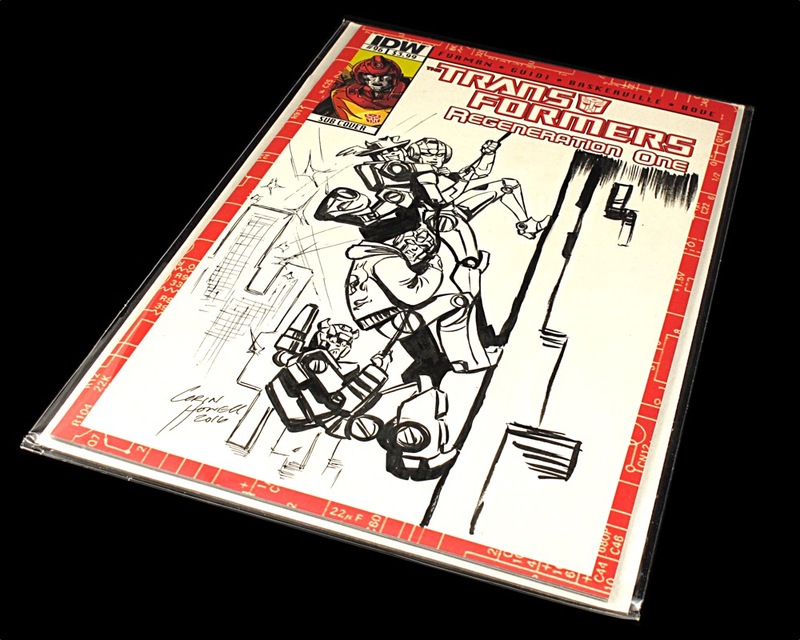 Like, for example, what you see at Terry Dotson do with his sketch covers. When he does Captain Marvel or umm Princess Leia or anything like all his beautiful women. Corin: He draws some pretty awesome girls okay. I love it. So, but umm. Just like the amount of time he puts into his sketch covers is just like…. where?…. how? Corin: They’re so beautiful. But it’s like he, he has to like you know, guys like that. Artists like that need to have some extra time. And those are individual sketch cover that is going to mean so much more to you at the end of the day then just a head shot. Corin: So like, we pride ourselves on having a challenge. Well, I like having a challenge on a sketch cover. Like, give me something really different and new or something like, you know, complex. Like, the price I give you is going to be totally worth it by the end of the day. Corin: Like, it’s going to be totally worth it by the time I’m done with it. Yoshi: So if somebody comes up to a con who hasn’t met you before. Presents a sketch cover. Do they have the option to… You know what, this is going to take me longer than the time I have at the con. Will you let me take it home and mail it back to you? Is that… Is that something you do. Corin: Yeah, that’s something I would do. Yoshi: What about if there is no convention and somebody just wants to get a hold of you to do a sketch cover. Are you too busy with your day-to-day comic work or is that something you can take on and do? Corin: That is something I can actually take on and do because it’s not like when you’re working on 11 by 17, that is a big piece of paper. Corin: That’s a lot of area you have to cover. Yoshi: Just paint the background black. Corin: Umm. Like, for example, my Kickstarter recently got, uhh, one of the commissions was Poison Ivy and Batman. So, I knew I had to take this tall piece of paper and fill all of it because the price that they paid, you know, this piece of art has to be worth what they paid. Corin: But having a smaller sketch cover, but still putting in that amount of definition and all the detail and everything like that. It just makes it so much easier because that way, also like… I go to a drawing group every week. So, I just take all my commissions with me and get them done there while we sit there for just hours just drawing. So, it’s like. That’s what I like to do. “I don’t know what to draw. I have this commission I gotta do. Let’s do this instead.” And so that’s like what I like to do every time I get commissions. Just take them to drawing group and be like, “I got this to do.” I’m still working, but having fun. So that’s what I do. I work on traditional stuff even when I’m at drawing group, but it’s still easier for me to have a small piece to work on. And it’s a challenge. Make you really think how can I tell a story in this tiny little image. Yoshi: Right. So what do you charge for a sketch cover? What are you basic rates and I’m sure you have have a speical rait for when someone comes up to you with something awesome. Corin: Starting price is $40 because you don’t know what they’re going to want. Yoshi: So $40 would be like a head shot? Corin: $40 would be like a head shot. $100 for like a full body right now. Corin: Head to toe would be $80 to $100. Then if you want to go all out it would be maybe $150 to $300. It really depends on what you want. And how much color you want in it because otherwise its all going to be black and white. Yoshi: That’s awesome. Thank you so much for your time. How do they get a hold of you to hire you for work? Corin: You can always find me on Twitter @rin237. Or you can find me, rinpin.tumblr.com. Everyone just calls me rinpin on there. Or you can find me on my website. My website is connected to all my social media. So you can find it on my Twitter page or my Tumblr page. On my website, there is a way to get a hold of me for commissions and get in contact with my rep, Jeff. He’s very happy to take all the commissions. He’s a very nice guy to talk to. And if you have any specialty commissions we’ll be happy to talk about that too. Corin: Well, we always get the specialty stuff. Sometimes we get like, some really, really cool just big pieces. I’m really excited for some of the Kickstarter stuff I got in. So I’m very excited and if you ever get a chance to talk to Jeff about a commission, I say go for it. Corin: And he doesn’t just rep me he reps like a ton of other artists. So, it’s awesome. Corin: Thank you. I enjoyed this. This is so much fun. Yoshi: Now the con needs to start. Corin: I know. There’s nobody here. Thank you guy so much for watching my interview with Corin Howell. If your interested in what other artists think about sketch covers, well I did an interview with Casey Coller and you can watch that here. I also did a basic sketch cover video and you can watch that here. Thanks so much for joining us.